Jesse James Home: A taste of what's in store during a visit to the historic house where Jesse James was shot by the coward whatzizname.... Watch Video. 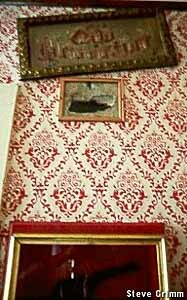 At the house where Jesse James was killed on April 3, 1882 in St. Joseph, Missouri, there is a sign out front saying "See the bullet hole". The bullet entered the wall after traveling through Jesse's head. Souvenir hunters chipped away at the hole, making it quite large. There is also a depression in the floor (created by souvenir hunters) where Jesse's head lay after he fell off his chair. Sculpture of Iron, Kansas City, KS - 46 mi.